Anyone who lives in a state or country that observes Daylight Savings Time received the gift of an extra hour this weekend. The fact that this hour falls in the middle of the night means that most people sleep right through it, but I wonder what would happen if you observes a nocturnal bird like an owl during the hour that gets reset. Could you still count it? I found myself in a beautiful part of New York that was so remote that birds apparently couldn’t find it. A couple of intrepid Blue Jays may have been chasing everything else away. Corey was pleased to enjoy another lovely autumn weekend in New York City. Fall migration was in full swing and he spent lots of time down by the coast sorting through the seabirds, sparrows, raptors, and finches. 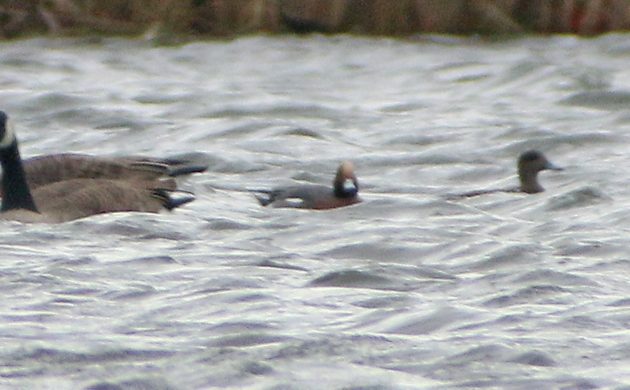 But his Best Bird of the Weekend was a dabbling duck he found on the East Pond of Jamaica Bay Wildlife Refuge, his first Eurasian Wigeon of the year! The juncos are back! The juncos are back! Ummm … do you not remember what DST was like with a small child who wakes by internal clock, not what the thing on the wall says?! Worst. Idea. Ever.